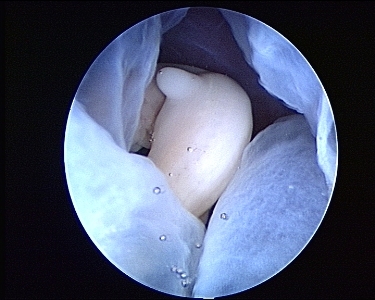 The most recent technique is the sterilization technique by placing inserts into the intramural part of the tubes, the so called STOP devices from Conceptus inc now called ESSURE. The ETCA was the prime investigator site in Europe in 1999. Patients volunteered for this new method of sterilization, after we obtained the green light of the Ethical Committee of the OCMW Antwerp, and they agreed to stay under observation for five years. We sterilized some 65 patients. Two of them at the private rooms. All patients agreed to try without anaesthesia. Only one was anaesthetised at the moment of the hysteroscopy. The principle is that a coil is brought into the intra-mural part of the tube. It is than released and spans the lumen of the intra-mural part of the tube and the junction between the endometrium and the intra-mural epithelium. The coil, now expanded, causes mini-trauma to the epithelium that reacts as in all tissue trauma by fibrin strands that connect the different parts of the tubes. These strands are than colonised by body own tissue cells that start to obstruct the lumen of the tube. This process takes some six weeks. Although the devices act as IUCD's the patients were instructed to use their contraceptive until six weeks after insertion. Not one of our patients became pregnant and all except for one patient were very happy about their decision. Because of the ingrowth of tissue over the total length of the device(4cm) this method of contraception is irreversible and this should be stressed when speaking to the patients. Another project is the visual evaluation of early pregnancy loss. Minutes before the currettage we use the vaginoscopic technique and pass a 3.8 mm through-flow hysteroscope up to the gestational sac. Pointed scissors are used to make an opening in the sac so that the embryo is exposed. 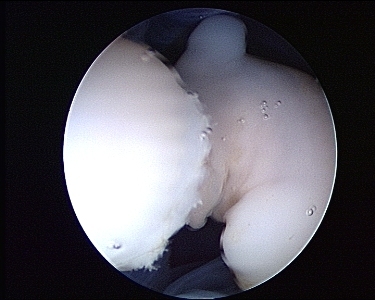 The embryo can than be examined on defects. These defects are in a second phase correlated to the embyonal stage. In most cases of early pregnancy loss we are then able to find a reason and to counsel the parents using the images.